John Brooks played at centre for Gloucester from 1931-37 and captained the club in 1935-36. He played for Gloucestershire until 1939, appearing in the 1934 County Championship Final and was an England trialist. J C Brooks was born in 1910 and educated at Tonbridge School and Cambridge University. An all round sportsman, he was second in the Under-16 half mile at Tonbridge in 1925 and played cricket for the school in their annual match against Clifton College at Lords. He failed to gain selection for the Cambridge rugby or cricket first teams but did play Rugby fives for the winning Cambridge VIII against Oxford in 1931. 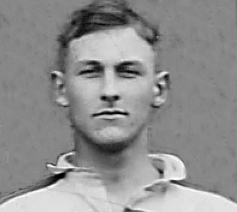 On leaving Cambridge, John Brooks made his debut for Gloucester on the wing against Swansea in November 1931. He played at scrum half and outside half before becoming a regular first team selection in the centre. Brooks was a determined character. In a match against Harlequins in April 1933, he’d retired to the touchline with severe cramp and had taken his boot off, but hobbled on to the field to make a try-saving tackle. Gloucester won 28-21. John Brooks started to gain recognition and was selected for England against The Possibles in December 1933. He played right through the season for Gloucestershire and appeared in the 1934 County Championship Final. The following season he became vice captain of Gloucester and captained Gloucestershire against Somerset. When selected as Gloucester captain for the 1935-36 season, he was described as having all the natural attributes of a successful captain – first class playing ability, keenness, experience and the happy knack of getting the best out of his colleagues. Brooks continued to play club cricket for Old Tonbridgians and Tewkesbury CC while with Gloucester. John Brooks moved north and made his debut for Kendal in September 1936, but continued to play occasionally for Gloucester that season. In 1938-39 the last season before WW2, he played in all Gloucestershire’s matches, but now as a Kendal player.